Reduce the amount of time you spend dusting and cleaning hardwood, laminate, or tile flooring without compromising the sanitation / hygiene. 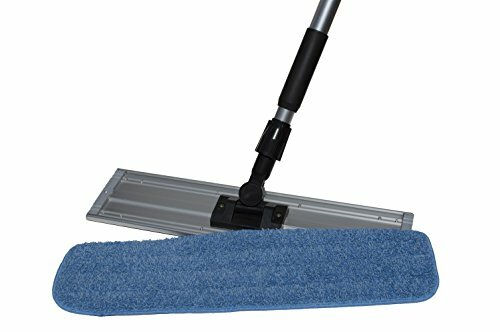 This commercial grade product contains one aluminum telescoping handle and 18" frame along with one machine washable microfiber wet or dry dust mop pad. This kit will allow you to eliminate the use and cost of a traditional mop bucket. A high percentage of the time spent mopping is associated with filling, draining, and wringing out traditional mop heads. Microfiber mop pads are the perfect accessory for your cleaning supply needs. Fibers are split during the manufacturing process which makes microfiber superior to other janitorial products when it comes to picking up dust and dirt particles without leaving behind lint. Microfiber is known to leave a clean, streak free surface by simply using small amounts of water or cleaner from a spray bottle. Simply remove the pad from the Velcro frame and moisten in water or your preferred green cleaning solution. Ring out the excess and then reattach to the frame for effective damp mopping. For light dust mopping or spot cleaning a spray bottle with water or your green cleaning solution can be used successfully. Washing Machine safe with NO fabric softener products or bleach. Use simple detergent without softeners or scents for best results. Tumble dry low, or hang to dry. Damp Mop Pad set works best cleaning Laminate, Hard Wood, or Tile Floors. If you have any questions about this product by Nine Forty, contact us by completing and submitting the form below. If you are looking for a specif part number, please include it with your message.